A small company with big plans, Vuthisa Technologies (VT), wants to play its role in the changing energy landscape of South Africa, even if it means taking a risk or two. 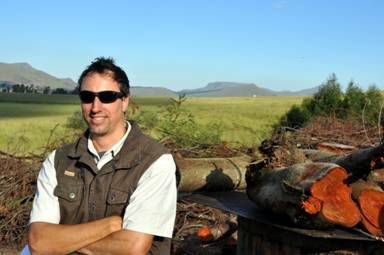 The company was founded by Kobus Venter, a forester with a keen interest in renewable energy projects. His vision is to convert the masses of solid biomass available in rural areas into Green Fuels, Biochar and even electricity and uplift the local emerging communities. At the company’s own expense it embarked on a 6-month feasibility trial late in 2011 to convert invasive jungle Wattle into charcoal. The farmer, on whose farm the trial was performed, had originally approached Vuthisa to rid his farm of Wattle that has for years been steadily encroaching on his rolling high altitude grasslands, afromontane forests and pristine wetlands. Apart from being a conservation-conscious individual the farmer also needed to increase his available grazing area. The trial had to be abandoned in May 2012 at the start of the fire season, but it was not in vain however as Vuthisa was finally notified in December 2012 that they had qualified to receive funding from the Department of Environmental Affairs’ Working for Water programme as part of the Natural Resource Management program (NRM) to manage the removal of Invasive Alien Plant species (IAPs). The ‘Vuthisa Charcoal Project’ aims to process some 23,000 tons of feedstock produced by their harvesting teams over 3 years into charcoal and other forest products. It is hoped that some 392 hectares of jungle wattle will be eradicated in the process. Venter stated that “Vuthisa Technologies also secured funding from the Energy and Environment Partnership, South and East Africa (EEP) to undertake a pilot study to build and test emission reducing (ER) kilns”. The leading donor is the Ministry for Foreign Affairs of Finland, whilst co-donors include Austria (ADA), United Kingdom (DFID), the EU Commission and the Nordic Development Fund. The project was shortlisted to be 1 of 33 in Africa and 1 of 7 in South Africa to receive funding and is known as the ‘Vuthisa Biochar Initiative’ whereby EEP will fund the field testing of their ‘3-drum Biochar Retort’. Venter says and he quotes a line from ‘The Biochar revolution’ (ISBN 978-1921630415) the most definitive work on the subject, that it is notable that from the year 1850 to 2000, 34% of carbon dioxide emissions have been attributed to land clearing, therefore, in a sense, the first goal of Biochar is to restore the carbon lost from the soil due to the past 150 years of agricultural practice. At the end, a particular durability of Biochar will enable the build-up of more carbon in soils, with further fertility benefits as the existence of Terra preta soils have shown us. Terra preta soils are fertile, black Biochar-rich soil found in scattered tracts throughout the Amazon basin, dating back to 450 to 8,000 B.C. “Biochar has the potential to sequestergigatonnes of atmospheric carbon per annum, making it the most potent engine of atmospheric cleansing we possess,“ concludes Venter. Some of the Biochar produced will be sent to the Cedara College of Agriculture to be used in field trials to assess the effects ofBiochar on plant productivity and soil health. Both the NRM and EEP projects are planned to commence from June 2013 onwards.